U.S. Stamp Catalogs are a requirement for everyone collecting or specializing in U.S. stamps. 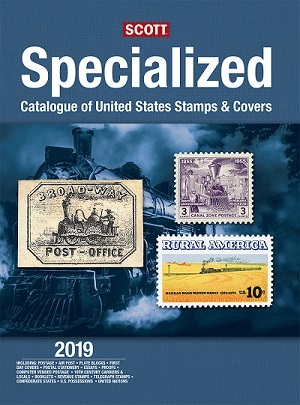 The Scott Specialized Catalogue of United States Stamps and Covers is a complete study of all the varieties of every type of stamp ever issued by the United States government, and more. The catalog includes detailed listings for postage stamps, cancellations and varieties, airmail stamps, plate blocks, first day covers, postal stationery, essays, proofs, carrier and local stamps, revenue stamps, telegraph stamps, Confederate States, U.S. possessions, and issues of the United Nations. The catalog also contains sections featuring, stamp collecting information and terms, a detailed stamp identifier, a subject index of Commemorative stamp issues, and a chart of territorial and statehood dates. For anyone specializing in or studying U.S. philately, this book is an absolute necessity. The publisher's suggested retail price for the current year's edition (shown above) is about $135.00. If having listings for the latest new issues is not important, prior editions can be found on eBay or at other internet stamp supplies sites much cheaper. The Scott Standard Postage Stamp Catalogue, Volume 1A and 1B, contains listings for U.S. postage stamps, postal stationery, revenues, U.S. possessions, and the United Nations at the beginning of the volume, which also includes other countries, whose names begin with the letters A - B. These have more abbreviated listings for the major types, and they would be suitable for a more general collector of U.S. stamps. The pricing of this volume is about the same as for the U.S. Specialized Catalog above. Scott catalogs, since the 2005 edition, have the stamp images printed in color. Here is a link to Scott (Amos) Publications, for the current editions of these catalogs. The Brookman Catalog is more of a retail price guide for U.S. stamps. Many dealers use this for selling U.S. stamps, and collectors utilize the catalog as a buying guide and a checklist. The last time I looked, a current year's edition was about $35.00. There are also various inexpensive guide books, which contain an overview of the major U.S. stamp issues. These are aimed more at the beginning stamp collector. Many foreign catalog publishers also have catalogs for U.S. stamps. Seller's of U.S. stamps use Scott Numbers though, and the numbering systems in the other catalogs would not be suitable for classifying, buying, or selling U.S. stamps here in North America. The affiliated eBay seller auction and store lots provided by eBay, Inc. are not the responsibility of the management of this website.